Visitors to Tate Modern's Soul of a Nation: Art in the Age of Black Power are confronted with three questions in the introductory wall text: How should an artist respond to political and cultural changes? Is there such a thing as 'Black art' or a 'Black aesthetic'? And is it more effective for an artist to create legible images or make abstract work when trying to communicate a message? A journey around the exhibition seeks to investigate these questions. 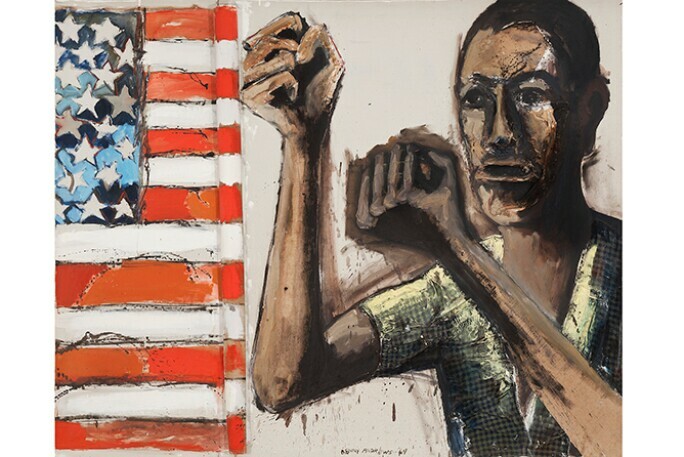 Situated as they were in the peak of Cold War America (1963 — late 1980s) the artists featured in Soul of a Nation were calling for a radical redefinition of Black America in opposition to a hostile state. In fact, works are often seen as vestiges of a past political movement and therefore overlooked by many as having true art historical value. What is most clearly projected in this exhibition is the strong sense of urgency these artists had to create art that resonated with their lived experiences. BENNY ANDREWS, DID THE BEAR SIT UNDER A TREE?, 1969. © ESTATE OF BENNY ANDREWS. The exhibition begins with the Spiral Group: a New York art collective incepted in 1963 by Romare Bearden, Charles Alston, Norman Lewis, and Hale Woodruff. The Spiral Group galvanized their brushes and pens as a source of dissidence during the years of the Civil Rights movement. The group began as an organizational body, sorting out logistics for the busing people to the 1963 March on Washington, where Martin Luther King Jr. gave his iconic 'I Have a Dream' speech. Later, the group took a visual pivot, although each artist kept his or her own unique stance. These artists focused on abstracting colour, often emphasising paint hues while deliberately avoiding blending or graduating the pigment. Norman Lewis' America the Beautiful, with its medley of white strokes against a slick black background; is an abstracted reference to the condition of blackness in a white nation-state. Only until one examines the canvas closer does one see the faint crosses and pointed white hats peeking out of the darkness, to suggest a nightmarish scene of a covert Klu Klux Klan gathering. 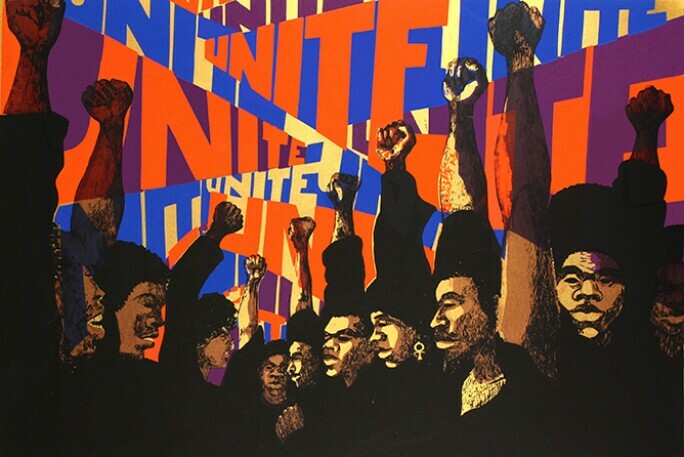 BARBARA JONES-HOGU, UNITE, 1971. © THE ARTIST. As one meanders through the exhibition, the abstraction of the earlier period becomes complicated with moments of figural depictions. The works by the art collective, AfriCOBRA (African Commune of Bad Relevant Artists) exemplify this movement toward the figurative. AfriCOBRA was founded in Chicago in 1968 by Jeff Donaldson, Wadsworth Jarrell, Jae Jarrell, Barbara Jones-Hogu and Gerald Williams. Their works centre around liberation and freedom, most evident in Wardworth Jarrell's Revolutionary (1972) which is truly a burst of colour. Revolutionary is motley of almost psychedelic shapes that form a figure of a man shouting into a microphone. The work’s power comes from its desire to highlight the black figure, showing black bodies in power, not subjugation. WADSWORTH JARRELL, REVOLUTIONARY, 1972. PRIVATE COLLECTION © WADSWORTH JARRELL. As a Black American, so much of what I see myself as today, comes from the philosophical legacy of the Civil Rights movement and the Black Power Movement. I remember learning about these topics in the American school system. Although a perplexing notion for my nine-year-old self, I recall how unilateral the discussion was — only discussing what was said to be 'non-violent' solutions and its supposed success. Generally, we learned to shame ‘black power’, and reject anything that would disprove the idea of post-Civil Rights Movement as post-racial. 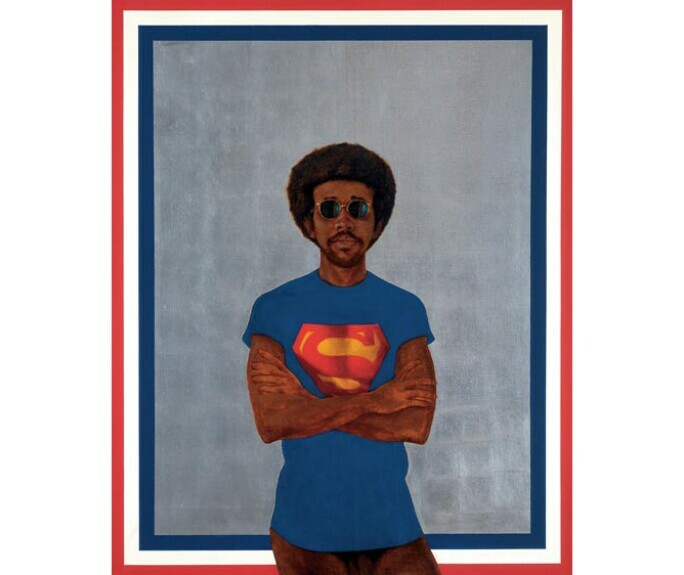 BARKLEY L. HENDRICKS, ICON FOR MY MAN SUPERMAN (SUPERMAN NEVER SAVED ANY BLACK PEOPLE — BOBBY SEALE), 1969. COLLECTION OF LIZ AND ERIC LEFKOFSKY © BARKLEY L. HENDRICKS. COURTESY OF THE ARTIST AND JACK SHAINMAN GALLERY, NEW YORK. Hyperaware of my own ethnicity at Tate Modern, the exhibition's potential to uplift Black American history and art remains elusive to those that need it the most. I was left disappointed that images of powerful black bodies in American visual culture as well as art history are still rarities. 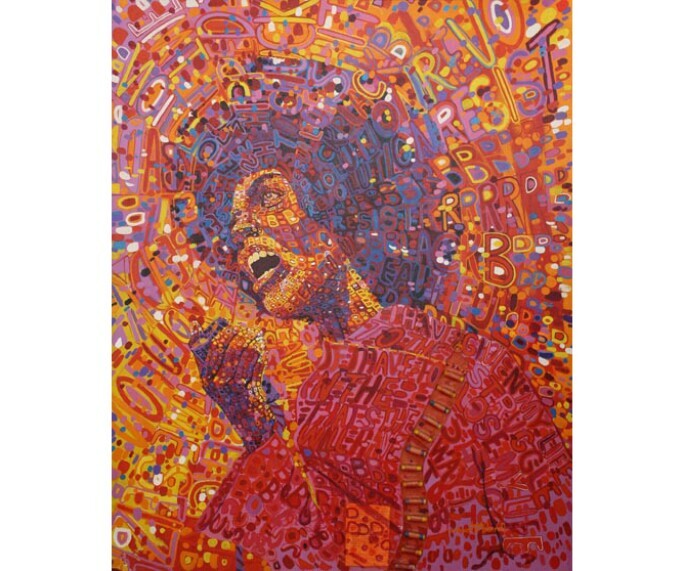 Soul of a Nation is a great homage to Black American art and its existence as a significant piece of world history. Particularly in the scope of the fine arts, black artists have been disregarded by many major American institutions until recently. In 1970, Melvin Edwards became the first Black American sculptor to have a solo exhibition at the Whitney, and as late as 2014, artist Carrie Mae Weems became the first African American woman to have a retrospective at the Guggenheim Museum. Even famed member of the Spiral Group, Norman Lewis, didn't have his first retrospective until 2015 at the Pennsylvania Academy of the Fine Arts, thirty years after the artist's death. Although these grandiose questions cannot be resolved in just one exhibition, the show provides fodder for understanding the artistic ramifications of one of the most enigmatic yet misunderstood activist slogans of the past century: black power.